Asian Games 2018 souvenirs are popular among visitors.
" 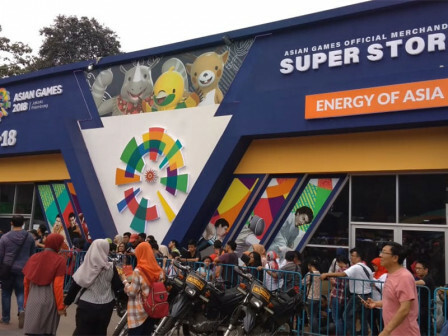 Visitors are willing to queue for hours to get the Asian Games official souvenirs"
It can be seen from many visitors who attend on Asian Fest at Gelora Bung Karno a day before Asian Games ended, on Saturday (9/1). One of Asian Games souvenir counter officer, Jasmin mentioned foreign and local visitors are hunting for Asian Games 2018 official souvenirs. "Visitors are willing to queue for hours to get the Asian Games official souvenirs," she said, Saturday (9/1). She explained, souvenir counter is opened in two sessions. It is opened at 10 AM-1 PM and 4 PM-8 PM. Her side limits 20 visitors per entry and instructs them to be patient while queuing. Visitors are also limited to buy particular souvenir such as Asian Games 2018 mascots (Kaka, Atung, and Bhin-Bhin). They can only buy three dolls per customer. "Other souvenir besides dolls can be bought more than three items," she added. Rita (35), one of the customers said she had queued from 9 AM to buy Asian Games 2018 mascot doll. "I buy Asian Games official doll souvenir because it is cute and I want it as a memento," she expressed. Other customers, Aliyah (40) said, she has bought Asian Games mascot dolls, two lunch boxes, and Asian Games pin. "I am happy and satisfied because I can buy the souvenirs I want even though I need to wait long enough for it," she stated.